Assassin's Creed III - Remastered - Buy and download the game here! "Benedict Arnold" missions: 4 memories of Connor's efforts to uncover Benedict Arnold's plan to surrender West Point to the British Army. "The Hidden Secret" Package: 3 additional missions that promise another four hours of gameplay in hidden Mayan ruins and on the high seas. Every success is rewarded with a weapon in the game! You'll also receive two single-player skins: the original Aquila captain's uniform and the garb of a traditional colonial assassin. "The Tyranny of King Washington": A three-part story that takes you to an alternative reality. George Washington, dominated by madness, subjugates the country with unlimited power. He went from president to tyrannical king. In this alternative world, Connor Ratonhnhakéton is and remains. Never becoming an assassin, he must face new trials to master skills that will allow him to overthrow the obsessed Washington and bring peace to his country once and for all. Assassin's Creed III - Remastered includes Assassin's Creed Liberation Remastered, which tells the unforgettable story of Aveline. Explore the bustling streets of New Orleans, voodoo-influenced swamps and ancient Mayan ruins. "The Tyranny of King Washington"
NOTE: The activation key must be used with a valid Uplay account. Internet connection required. Kindle the revolution! Slip into the role of a master assassin born into the beauty and brutality of America in the 18th century. The year is 1775 and the American colonies are planning an uprising. You slip into the role of Connor, an Assassin who has sworn to help his people and his nation to freedom. To achieve his goal, he must chase his enemies through a vast, open and realistic game world. Unleash deadly skills in brutal quests that take you from chaotic streets to bloody battlefields in the hostile wilderness of America and beyond. Meet legendary heroes of American history and unite with them to defeat the enemies of freedom. 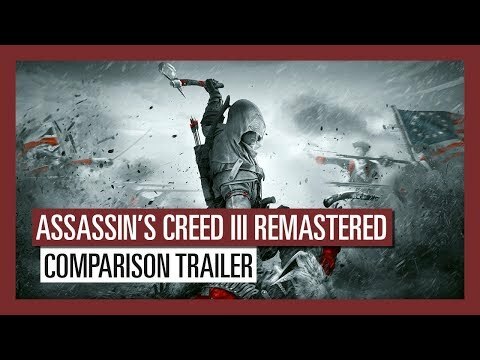 In Assassin's Creed III Remastered, you play as Connor, the warrior son of an Native American and a British. As the bloody revolution draws closer, your clan is threatened by a powerful group that wants to defeat the American Revolution and bring the 13 colonies under their control. You dedicate your life to the struggle for freedom after your village is destroyed and embark on a decade-long journey to reach your goal. Assassin's Creed III Remastered includes Assassin's Creed Liberation Remastered, which tells the unforgettable story of Aveline. Explore the bustling streets of New Orleans, voodoo-influenced swamps and ancient Mayan ruins. Also included are all of the original game's individual DLCs: Benedict Arnold Missions, The Hidden Secret, and The Tyranny of King Washington. The most beautiful version of the game! Fight for peace in the riots of the American Revolution! Experience the Assassin's Creed universe on the threshold of the American Revolution. Play as Connor - warrior son of an Native American and a British - for the peace of the nation. Explore a vast open game world! Connor's story takes you to unique locations: Boston, New York, The Borderlands, Epic Sea Battles.